I also listened to bootleg albums of early Clash locked in my yellow bedroom, and freshman year went to a couple high school dances where they actually had live bands play. It was straight out of Pretty In Pink. We slow danced to Stairway To Heaven and even made out a little if we could escape the chaperones' eye. Dancing and kissing to Led Zepplin, locked in a sweaty hormonal embrace seems unimaginably romantic to me now after having had years of one-night-stands, online dating, and a couple failed marriages. By today's standards high school may seem too young to be smoking but boy would I love to go back to that freshman year of innocent romance. However everything after freshman year was, for me, a slide into booze, drugs, and rebellion which you can read a bit about here. In general I am not nostalgic for high school. In fact I don't remember most of it. Certainly not the people who now friend request me on FaceBook. But in the 1983 year book personality polls ("most likely to succeed", "biggest flirt", "class clown" etc.) I was voted "most memorable". This was probably because I entered high school as part of the "in" crowd - the popular kids - before breaking away and turning all sullen and punk rock. 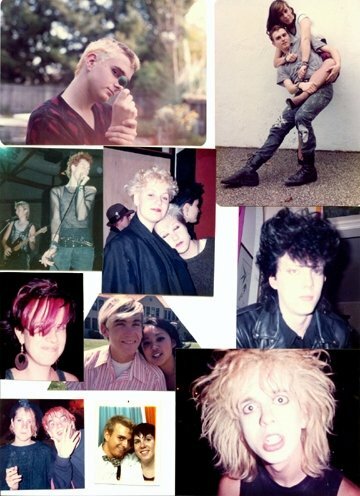 I was known by both groups, and in those days it was still considered a bit shocking and a bit of a statement to be punk. If you went to high school in the 70s or 80s I'd love to hear some tidbits of what you remember. What was your school culture back in those days? We had of course The Jocks, The Burnouts, the kids who hung out on The Wall (ie. the popular crowd), The Theater Group, The Cholas (you'll know what I mean if you lived in California), The Nerds, and of course The Punks (in those early days of American punk there was not yet the subset of Goths - we were all lumped together). I don't remember The Band Geeks but probably because they weren't even on my radar. I wonder what the segregated groups are called these days? Please also comment on that if you know.